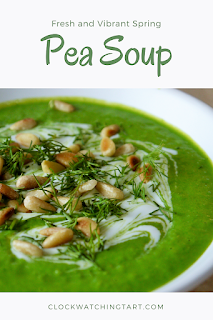 This extremely simple soup is perfect for spring! It is served at room temperature, so you can make it a little in advance and garnish just before serving. Of course, fresh peas are the best thing ever. But this tasted very sweet and delicious with frozen peas, so you can enjoy a taste of springtime anytime. Thaw peas with cold water if necessary. Bring a pot of water to a boil and add the peas. Wait 30 seconds and add the spinach and garlic. The water should just come back to a boil in about 20-30 seconds, then drain the pea mixture into a colander and rinse with cold water. Add the pea mixture to a blender and pour in the chicken stock. Add salt and puree until very smooth. Pour the soup into small bowls to serve. This will serve 4-6 for a small appetizer or side dish, or 2-3 for lunch. Add a few little dollops of crème fraîche, sour cream or greek yogurt to each bowl. Drag the tip of a wooden skewer or toothpick through the cream to make it all pretty. So easy, but so lovely! It only takes a few minutes to whip this up but it looks special. 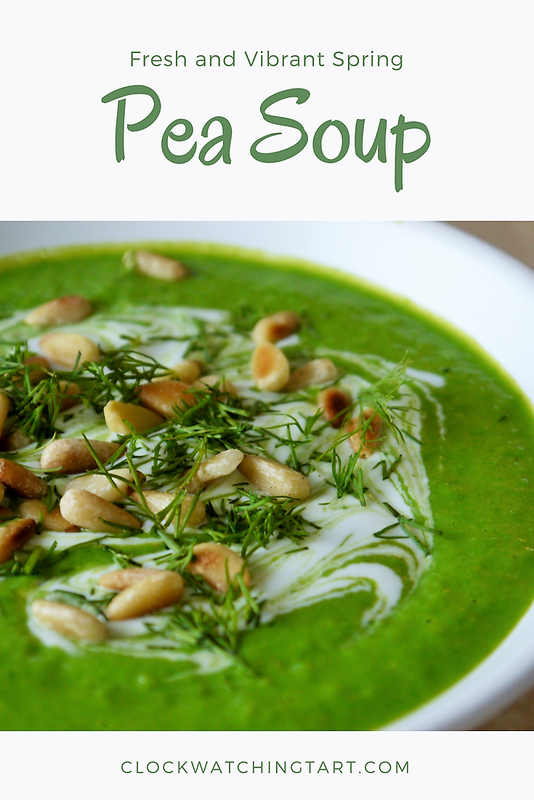 Top the soup with toasted pine nuts and a little chopped dill. This makes a lovely starter or side dish with lamb in the spring. Leftovers work great chilled or at room temperature for lunch the next day.